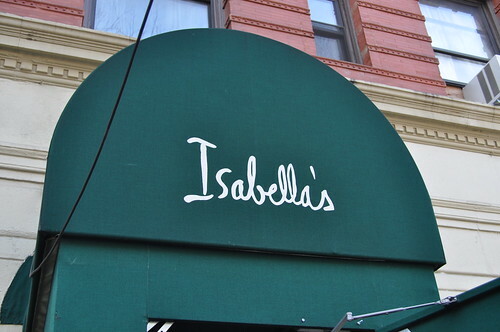 To start off birthday festivities last Saturday, Marcus and I went to Isabella's of the Upper West Side for lunch. I'd been meaning to try Isabella's for brunch for quite some time now, but I had recently found out that on Sundays (the classic time for brunch), the restaurant doesn't accept any reservations, maintaining a "first come, first served" policy, which gives brunch goers an equal chance to score a table (just have to get there early)! I was worried that the policy carried over to Saturday mornings and afternoons. Luckily, I was able to score a reservation on OpenTable an hour before the said time at 1:45 PM, because when we arrived, there was a crowd of people waiting for tables--so no waiting on our part! 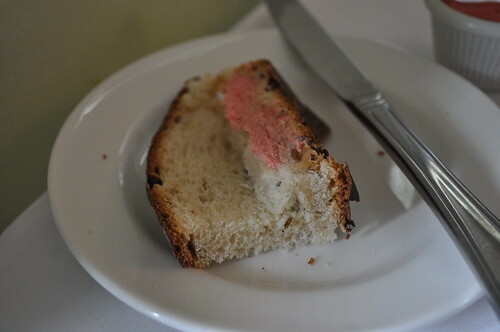 Our server gave us a bread basket alongside strawberry-flavored butter. I spread some of this butter on the sourdough bread from the bread basket, and it was an awesome combination! The butter was creamy and slightly tart from the strawberries, and I loved how there were some strawberry seeds in there, too. I may or may not have finished off the bread basket solely for having more strawberry butter, haha. Marcus suggested we start with the crispy Point Judith (incidentally a small village and cape of Narrangansett, Rhode Island) calamari with spicy tomato sauce and tzatziki sauce. 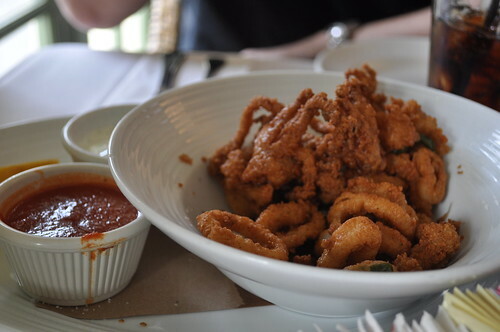 The breading of the fried calamari was light and mostly crispy (though soggy on some pieces), but what I enjoyed most about this starter was the spicy tomato sauce. It had a little more punch and flavor than the typical sweet marinara sauce paired with friend calamari appetizers. 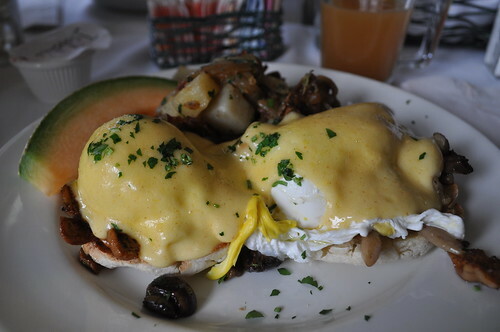 I ordered the wild mushroom benedict with truffled hollandaise sauce primarily due to my intense love of mushrooms. From what I recall, there were a mix of chanterelles, black trumpets, porcinis, and some others. The English muffin halves maintained their toasted integrity with a perfectly poached egg over the mushrooms topped with this really amazing hollandaise sauce I've ever had. It was creamy with the perfect addition of truffle flavor (either from oil or shavings). It paired very well with the mushrooms (as truffles are fruiting bodies of underground mushrooms). 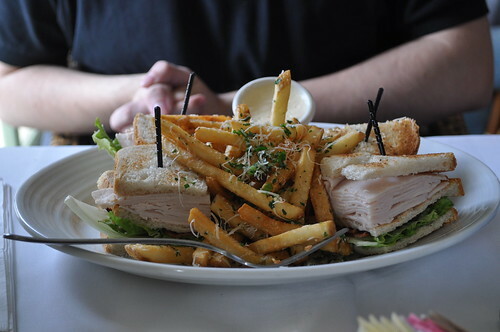 Marcus had the turkey club sandwich with sourdough bread, Applewood bacon, and Parmesan fries. Any turkey club sandwich which contains sourdough bread and bacon always gets an A in my book. Applewood bacon has been a recent favorite of ours. It is actually bacon cured with applewood (i.e., apple tree wood) smoke, as opposed to the generic "hardwood smoked" style of bacon, where the type of wood is undisclosed and unspecific. Though it saddened me when I found out he ordered it without avocado, Marcus enjoyed this sandwich very much. It was a very characteristic, Marcus-type dish--something I predicted he would order, haha. I could probably do without the shaved Parmesan over the fries, but Marcus didn't seem to mind, until the end, where he was discard it over to the side. Findings: I recommend Isabella's for Saturday lunch or brunch. While its entire Sunday brunch menu isn't offered on Saturdays, they offer "brunch additions" (i.e., a supplement to the regular lunch menu) from which I ordered my wild mushroom benedict. 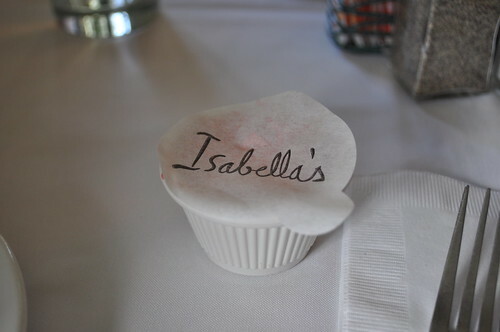 I'd say being able to make reservations at Isabella's on Saturday is definitely a plus, as its Sunday brunch has a strict no reservation policy, resulting in what may be an endless wait for a much desired table on Sunday morning or afternoon. Also, the atmosphere is very casual, making it for the great choice for post-hangover eats. Plus, the strawberry butter is so delicious! Price point: $10 for a starter; $14 for each entrée.